The Japanese American Living Legacy organization created a new working committee, the Nikkei Writers Guild, poised to focus on publishing literary works regarding the Japanese American community. This new working group addresses the need to encourage Japanese American authors to publish literary works that portray the many facets of our community. The Nikkei Writers Guild plans to supplement publishing expenses for first-time authors. The degree of financial support will be determined on a case-by-case basis. JA Living Legacy will introduce its authors to the diverse community network as part of a marketing base; connecting our community through literature is a natural extension of our organization's mission. Our publications are made possible by donations and sales revenue from our publications. Please contribute to future publications by clicking the "Donate" button below. An Astronaut's Legacy: The Story of Ellison S. Onizuka will be the ninth book published by Nikkei Writers Guild, a division of Japanese American Living Legacy. This is Lisa Nikaido Arakaki's first publication and Nikkei Writers Guild's first female author and children's story. It's been 26 years since the space shuttle Challenger disaster. For many of us who witnessed the horror of that flight, the reality of spaceflight's risks curtailed whimsical fantasies of traveling to the moon in the near future. For the Nikkei community, it was especially heartbreaking - we lost our hometown hero, Ellison S. Onizuka. Since then, books, stories and articles have been written about the disaster but not too much is known about the quiet sansei astronaut. Arakaki introduces Onizuka's life in illustrations so that his life story can be experienced by younger generations. Illustrator Mitchell Fong, a native from Hawaii, worked to bring Arakaki's words to life. Together with Sonny Abalos from Phase Two Graphics, the final piece has come alive! 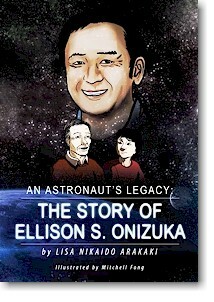 Order An Astronaut's Legacy: The Story of Ellison S. Onizuka online by clicking the "Add to Cart" button below. 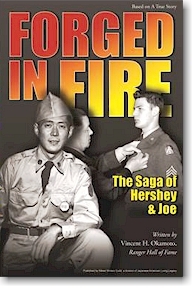 Forged in Fire - The Saga of Hershey & Joe presents a fresh perspective on the Korean War as experienced by two prisoners of war. Vincent H. Okamoto's detailed account transports readers to a Korea that few have experienced and even fewer have survived. Witness the friendship develop between two very different individuals faced with relentless wartime conditions. Based on a true story, Okamoto vividly details the horrors of war through the experience of surviving a death camp and the challenges of coming home to readjust to civilian life. Order Forged in Fire - The Saga of Hershey & Joe online by clicking the "Add to Cart" button below. The Rafu Shimpo and Japanese American Living Legacy have partnered to create a keepsake book, Proud to Serve that contains the names of 20,000 Nisei men and women who served during World War II. The book will be over 400 pages with a color paperback cover. 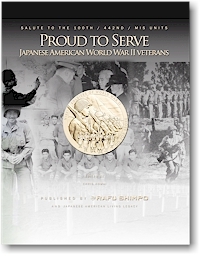 Along with Proud to Serve will be a special edition of the Rafu Shimpo dedicated specifically to the Congressional Gold Medal, regional ceremonies, and other articles, many never before published. It's a once in a lifetime treasure! Order Proud To Serve online by clicking the "Add to Cart" button below. 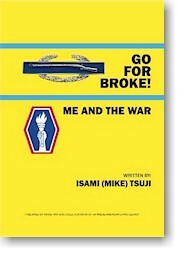 Isami Tsuji's Go For Broke: Me and the War presents an unabashed and refreshing perspective of World War II as experienced by an ordinary guy thrust into extraordinary circumstances. Tsujiï¿½s detailed accounts transport readers to a period in his life that nurtured his humanity. The stories of the 442nd Regimental Combat Team are legend, heralding feats of courage and perseverance. This latest story will endear readers by introducing them to an often untold side of that war that reveals the many battles our community's soldiers faced within themselves. Order GO FOR BROKE! Me and the War online by clicking the "Add to Cart" button below. 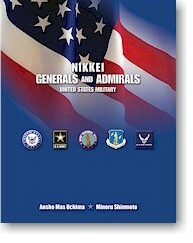 Nikkei Writers Guild, a division of Japanese American Living Legacy, published our fifth book, NIKKEI ADMIRALS AND GENERALS. This collection of biographies is the first to illustrate the accomplishments of those Nikkei in the American military who have risen to the rank of Admiral or General. Nowhere else can you find this much information on the true legacy of Japanese Americans in the military. Nikkei Generals and Admirals will be offered at an introductory price of $32 (includes tax). Order Nikkei Admirals and Generals online by clicking the "Add to Cart" button below. Uchima and Shinmoto include the community's religious institutions, language schools, public schools, social clubs, veterans who were killed-in-action and various biographical profiles of families that lived in Seinan during the early 1920s through just after World War II. Many photographs and illustrations are also included to help readers visualize this snapshot in the history of the Nikkei community in Southwest Los Angeles. The authors were mindful to put this community snapshot in a historical context so that readers would understand the significance of the early immigrant Issei pioneers, the effects of rampant racism, the need to coexist with the surrounding Black community, the disruptive force of Executive Order 9066 and a community that tried to hold itself together through an ugly war to provide a firm stepping stone toward today's Japanese American community in Southern California. 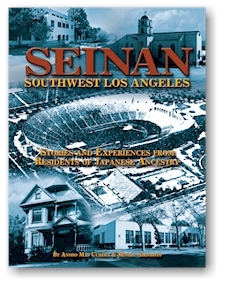 Order SEINAN - SOUTHWEST LOS ANGELES, Stories and Experiences from Residents of Japanese Ancestry online by clicking the "Add to Cart" button below. This book includes the story of Kazuo Masuda, the struggles his family endured during and after World War II and ultimately the legacy this young man left behind; it also contains numerous never before seen photos provided by the Masuda family. Read the story of Kazuo Masuda and understand that his sacrifice represents one of over 800 Japanese American men who gave their lives for America's freedom during World War II. 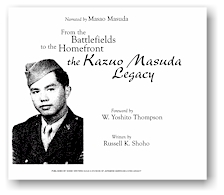 Order FROM THE BATTLEFIELDS TO THE HOMEFRONT, THE KAZUO MASUDA LEGACY online by clicking the "Add to Cart" button below. WOLFHOUND SAMURAI is the story of one Japanese American soldier's experience during his tour of duty in Vietnam. Earning the respect of his men, cradling his humanity, and later being heralded a hero ... come at an unimaginable price. 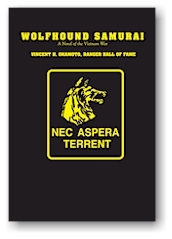 Order WOLFHOUND SAMURAI online by clicking the "Add to Cart" button below.